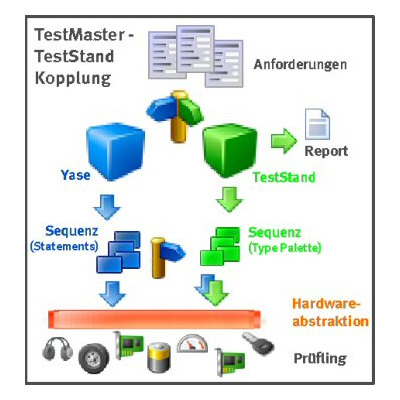 The TestMaster® software enables the configuration of an on-the-spot test system or test bench for the test engineer. Versatile TestMaster function modules and programming interfaces are available for the cost-effective integration of simple test systems up to complex test benches with HIL components in a computer network. 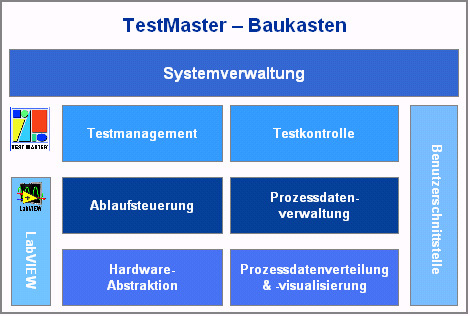 The open concept of the TestMaster platform supports the use of any hardware in the test system. Traditional instrumentation components, powerful FPGA technology, bus interfaces such as CAN or Profibus, RF measurement but also image processing and the integrated use of complex motion systems or multi-axis robots in a test system is easily possible. Over open data interfaces, the seamless collaboration with different test management systems has already been implemented many times. This opens the direct path to the implementation of requirements in test results. Thus, TestMaster ensures the fast return of investment and offers the durability required by a modern test concept. TestMaster solutions provide ease of use with high flexibility and performance. enables interactive control, operation and setup. is extensible and configurable by the user. The TestMaster interface provides access to all functions of the test system via configurable menus and buttons. Configuration and interactive operation of the functions and signals takes place via graphical user interfaces. The function windows fit tightly into a frame. This also applies to user-programmed LabVIEW interfaces. The creation, maintaining and evaluating of test cases is an essential, labor-intensive phase of the test process. The test system is the central element in the test process. It processes the test sequences created from the requirements, evaluates the results and generates the resulting test reports. Complex tasks require an efficient overall test concept. The adoption of test specifications from test management systems and the return of structured event data is an indispensable feature of the test system. Only this enables a consistent and effective test process chain from the requirement management system to coverage analysis. TestMaster offers the required data-technically lucidly structured interfaces. In addition, further concepts for the implementation of abstractly described test procedures are consistently implemented. Test procedures are easily defined in TestMaster sequences by the test engineer. They build the base for the test execution. The signal access takes place via user-defined names. The TestMaster hardware abstraction allows the use of any hardware in the test system. Also, an integration of real-time and embedded systems (FPGA), e.g. for hardware-in-the-loop simulation (HIL) is provided. A key component of the TestMaster environment is the powerful sequencer. The sequenzer is supplemented by the easy-to-use sequence editor YASE to create autoematic processes. 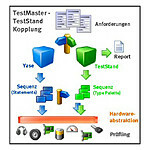 Sequences are used to automate all processes and tests in TestMaster. The scope of the sequencer can easily be extended with LabVIEW. YASE allows to create test sequences without programming knowledge by combining predefined commands - so-called statements. These are compiled by the user and provided with parameters. Selection options prevent incorrect entries and support the user in the sequence creation. YASE-generated TestMaster sequences can be run on multiple target systems, including Windows, Linux, LabVIEW Real-Time, and FPGA. Built-in debugging capabilities support the goal-oriented development of sequences in distributed system architectures. Technically, sequences support parallel processes and real-time execution. The sequence editor can be started independently of the TestMaster.